Inder Loves Folk Art: Maintenance. Thank you for all of your sweet words and condolences on my last post, it meant so much to me! We are doing well. We miss Crouton, but we are glad he had a quick and peaceful passing. Omie, for her part, has been promoted to "end of bed" status, and I was joking that she probably thinks she died and went to heaven. When I invited her into the bed, she seemed uncertain at first, but once she hopped up, she got under the covers and practically melted into the soft mattress, heaving a deep sigh of happiness. If there was a tinge of "Finally, that other guy is gone and I am restored to my rightful spot!" detectable in her sigh, well, who can blame her? It is a fact that pit bulls will fight tenaciously ... especially for pillows, blankets, and comforters. Yesterday, Joe helped me take my sewing machine apart, clean and oil it, and put it back together. Joe is fascinated by machines and mechanics. Upon seeing all of the lint inside the machine, he said, "It's dirty because you sew too much!" Pretty much. He turned the hand crank and watched the "turny things" (a.k.a. gears) turn the bobbin case. When it came time to put it all back together, he helped me screw the case shut again. Like his father, Joe has great spatial sense and a knack for figuring out how things work. I have been promising him that I would start teaching him to sew - he can't reach the floor pedal right now, but my machine does have a start/stop button. To be honest, I've never even used the start/stop button, so I am completely clueless about how it works. I'm more of a "pedal to the metal" kind of gal, myself. Have you taught your child to sew? When did you start? Did you use the foot pedal or did you do it another way? In other "maintenance" news, after blogging here for almost six years (! ), I finally ponied up for my own domain name! I feel like a pro now. To celebrate, I updated my banner to include photos of both of my children. Crazy, right? Thank you for reading and sharing your thoughts and joining me in this space. Can i borrow joe for my sewing machine maintance....? i just peeked in yesterday and the amount of lint and dust in there scares me. I tend to clean my machines out VERY infrequently, and only after my machine starts running like crap, so it's a hot mess when I finally get around to it! Ooh nice domain name! I wouldn't even know how to do that. Love that Joe is helping with your machine maintenance. I think one of the things I like about sewing machines it the taking apart and oiling etc, that makes me feel vaguely mechanically competent! Hmm... I think I started the big boys with a bit of hand stitching in an embroidery hoop. I reckon the first things they machine-stitched were pillowcases which are great - straight lines, about as simple as it gets. But they would have been big enough to reach the pedal... maybe 7 or 8? I agree - sewing machines are one of the few machines that I have ANY understanding of! And hahaha, oh, right! Hand sewing! The thing is, I think Joe is far more interested in sewing machines than actually sewing, so I don't know how into hand sewing he'd be! Getting your own domain name and routing your regular Blogger blog to it is pretty easy, it turns out. And cheap. A whopping $10/year! What a sweet way to spend time with Joe. The new masthead looks great, too. Nice to see sweet Maggie there. Congrats on the domain name! Joe is at an age where he really wants to help out and participate in our activities, and it's really fun! 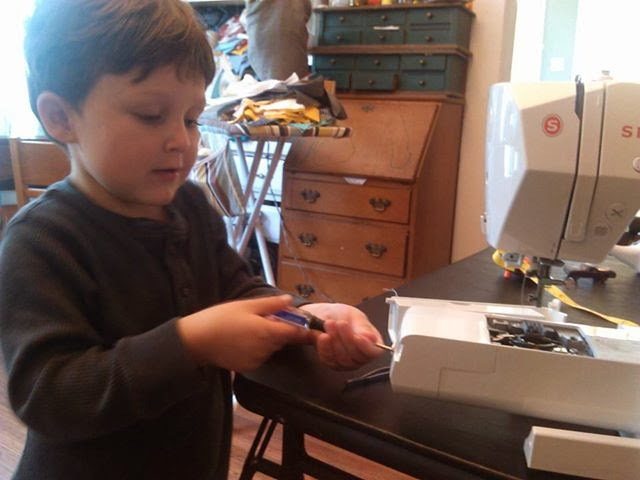 He is a pretty common sense kid, so I am past worrying that he will hurt himself as much as I used to - luckily, it's pretty hard to hurt yourself with an unplugged sewing machine. He likes to help me lay out patterns and pin them. Taking pins in and out of a pincushion (while discussing how sharp and pokey they are) is a lot of fun, it turns out!